Certain moments in life change everything. The trajectory splinters, and there’s no turning back. 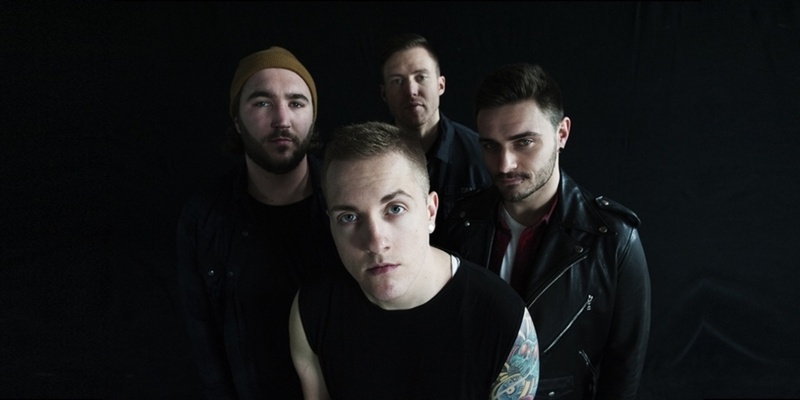 I Prevail—Brian Burkheiser [clean vocals], Eric Vanlerberghe [harsh vocals], Steve Menoian [guitar], Dylan Bowman [rhythm guitar] –explore this phenomenon with their full-length debut, Lifelines [Fearless Records]. “Lifelines are a great visual for certain points in your life,” adds Brian. It’s a line you can’t go backward from or ignore. For us, the path split from the moment we all created I Prevail. I Prevail are no strangers to this experience. After the release of the quartet’s 2014 EP, Heart vs. Mind, nothing would ever be the same. The EP moved over 100,000 copies as the Detroit band toured with the likes of Hollywood Undead and Pierce the Veil. Meanwhile, the group’s cover of Taylor Swift’s “Blank Space” sold 500,000 plus singles, went Top 20 on Active Rock Radio, generated over 50 million views on YouTube and 30 million-plus Spotify streams (earning them a gold plaque for their walls). The band was nominated for “Breakthrough Band” at the 2016 Alternative Press Music Awards and garnered features from Billboard, Detroit Free Press, Alternative Press, Rock Sound, AXS, Loudwire, and many more. Everything aligned and had set the stage perfectly their debut full-length, Lifelines. In early 2016, the boys retreated to Wall of Sound Studios in the small and secluded town of Riley, Michigan to work with trusted producers B.J. Perry and John Pregler. With nearly two years on the road under their belt, the group fully cemented their style, merging entrancing hooks and a powerful music breakdown. Lifelines debuted October 21st, 2016 and has sold almost 200,000 copies worldwide. The first single “Scars” erupts from a propulsive riff into an unshakable anthem teetering between a hypnotic harmony and a hard-hitting groove. It’s immediately infectious. Elsewhere on the album “Stuck in Your Head” sees a magnetic vocal in tandem with a bombastic drumbeat and hyper-charged guitars making the song live up to its name. “LIFELINES are the fine lines between order and chaos and the time we spend between them. Lifelines debuted at #1 on the Alternative Albums, Hard Music Albums, and Rock Albums charts, #9 Top Album, and #15 on the Billboard Top 200. Alternative Press named Lifelines one of the Best Debut albums of 2016, nominating them for Breakthrough Artists in the 2016 Alternative Press Music Awards. The band’s singles “Stuck in Your Head,” “Scars,” and “Alone” have all reached #1 on SiriusXM Octane Radio charts.